Planning Commission |May 7th – Canceled due to lack of agenda items. Leaves will be picked up on your regular trash pickup day in no larger than 30-gallon, biodegradable brown paper bags. Leaves placed out in plastic trash bags will not be collected. 30 gallon bio-degradable paper bags can be purchased at a cost of 40 cents a bag, Monday through Friday from 8:30 a.m. to 4:30 p.m., at the Butler Township Municipal Building, 290 South Duffy Road, Butler, PA 16001. MEET neighbors, LEARN something new, HELP your community! Butler Township will once again be participating in the Great American Clean-up of PA. The Pennsylvania event is held in conjunction with Keep America Beautiful’s Great American Clean-up. The program will run from March 1st through May 31st. Anyone interested in doing clean-up along any of the roadways in Butler Township can register by contacting the Township Administration Building at 724-283-3430, X 212 or email mlove@butlertwp.org. Just let us know your name, number of volunteers in your group, where you plan on doing the clean-up and the date of the clean-up. The township will provide the gloves, safety vests and trash bags for your group. Once the clean-up is done, please contact the township so that we can make arrangements to have the trash bags picked up. All 67 counties in Pennsylvania were represented in the 2018 Great American Cleanup of PA by the 108,638 volunteers. These volunteers collected over 6.6 million pounds of trash, 1.1 million pounds of recyclable material and properly disposed of almost 20,000 tires. They cleaned 8,915 miles of roads, railroad tracks, trails, waterways, and shorelines. Volunteers also planted 10,979 trees, bulbs, and plants in an effort to keep Pennsylvania beautiful. Thank you to everyone who participated in the event last year. PITTSBURGH – Butler Township was honored at a ceremony on March 8, 2019 as a 2019 Banner Community. The program, sponsored by Allegheny County and the Allegheny League of Municipalities, recognizes communities that show a commitment to professional development, prudent fiscal management, transparency, accountability, and proactive communications to engage community stakeholders. A total of 65 municipalities and four municipal authorities were recognized this year, the program’s seventh year. “We were honored to have Butler Township again recognized as a 2019 Banner Community,” said Dave Zarnick, Commissioner. “The program recognizes Butler Township’s commitment to our residents and to providing services through best practices. We look forward to being a Banner Community for years to come”. Assistant Manager, Cheryl McNeill is hopeful that a similar program could come to Butler County to encourage local government excellence in Butler County as well. Butler Township and Cranberry Township are the only two Butler County municipalities recognized by ALOM for this distinction. The March 8 press event and ceremony, attended by Commissioner Zarnick and Assistant Manager McNeill, was followed by a luncheon sponsored by Herbert, Rowland & Grubic (HRG) at the Rivers Club in downtown Pittsburgh. Butler Township is a member of the Allegheny League of Municipalities, a nonprofit organization created in the early 1960s to coordinate the needs of the area’s local elected officials. In 1974, it was officially established as the Allegheny League of Municipalities to coordinate, advocate and educate the hundreds of elected officials within its member municipalities in Allegheny County and southwestern Pennsylvania. The organization educates elected officials, delivers essential resources, and advocates for sound policy and legislation. Waste Management is the contracted trash hauler for Butler Township residents beginning January 1, 2019. 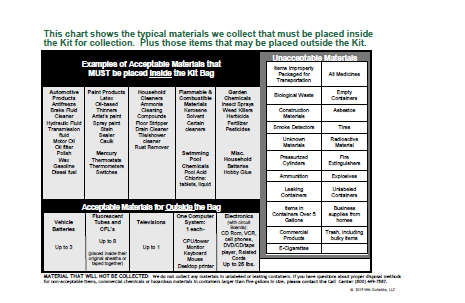 You can contact Waste management Customer Service at 1-800-866-4460. Each residence will receive a new 95 gallon cart for trash and a 95 gallon cart for recyclables. 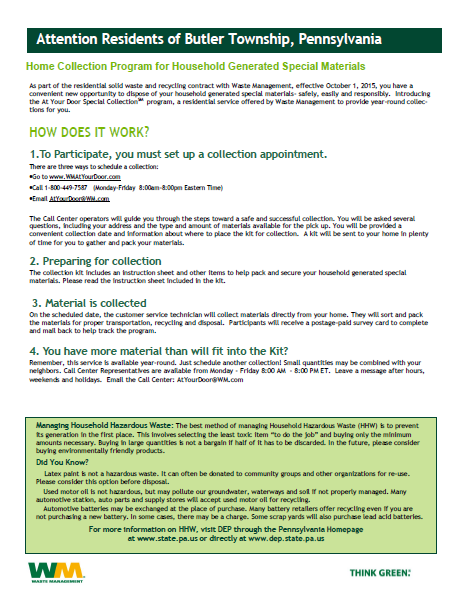 Information on the new service has been mailed to each residence, but you can view the flyer by clicking on the following link: Waste Management Mailer 2019. For information on rates check out the Trash & Recycling page. As of January 1, 2019, Waste Management is the residential solid waste and recycling hauler for Butler Township. With this new contract, Household Hazardous Waste and Electronic Recycling Collection will be included in your monthly fee. To participate in this program please read the following information provided by Waste Management and follow the instructions to set up a pick up. For a printable version of the information click This Link. Butler Township has posted the Fall 2018 Newsletter to the website. Click on this link: Newsletters, to view the latest edition. This edition of the newsletter will not be mailed, but will only be available digitally. By offering the newsletters digitally, thus saving printing and mailing costs, the Township will be able to publish them more frequently. Residents are encouraged to follow the Township on Facebook to receive notices as to when new editions of the newsletter will be posted on the website. For residents without access to a computer, paper copies will be available at the Butler Township Municipal Building. Butler Township will be offering public tours of Preston Park including the residence and the grounds on the following dates in 2019. Saturday, April 27th at 9:30 a.m.
Saturday, May 18th at 9:30 a.m.
Wednesday, June 19th at 6:00 p.m.
Wednesday, September 18th at 9:30 a.m.
Saturday, October 12th at 9:30 a.m.
Saturday, November 30th at 9:30 a.m. This 2 to 3 hour walking tour is available at no cost, but registration is required and spaces are limited. In addition to the dates listed above, private group tours may also be arranged for groups of 10 or more. For more information or to register for a tour contact the Administration Office at extension 212 or mlove@butlertwp.org. Butler Township has received a Hodge Fund Grant which was used to purchase smoke detectors and combination smoke and carbon monoxide detectors. These detectors are free to Butler Township residences where children reside or frequently visit. At this time there are only smoke detectors available. Residents can receive two smoke detectors per household, which are available at the Butler Township Municipal Building at the main reception area. Proof of residency is required. Click on the following links to find out some of the activities going on in Butler County.